Monmouth Pain & Rehabilitation offers testing for concussions as well as concussion recovery programs in Monmouth & Ocean County. If you have a child athlete, we recommend bringing them in for a baseline test – this makes it easy to diagnose a concussion if and when it does arise. If you are interested in the baseline test, or are seeking treatment for a concussion, call 732-365-0301 or fill out the form on the right side of this page. The issue of concussions in sports has been prevalent for years, specifically in the NFL. Recently, however, concussions have become an increasing problem in the youth sports arena. 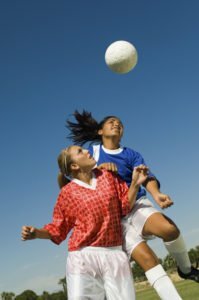 A recent study has shown that concussions in youth sports are up approximately 500% from 2010 to 2014. Concussion diagnoses can range from mild to severe and if not treated pro perly, symptoms may last for several weeks or months after the initial injury. Concussions are brain injuries which occur when the brain is violently shaken either during rapid movement changes (such as whiplash) or when the head is hit. This unpredicted occurrence can result in immediate or delayed changes in the brain’s chemistry and function. Monmouth Pain and Rehabilitation offers FREE ImPACT baseline concussion testing in Shrewsbury, Freehold, Wall, & Lacey NJ for all children between the ages of 5-14 ($75 value.) An ImPACT concussion test is a 25 minute computerized neurocognitive test that provides a baseline of your child’s cognitive brain function. In the event of any traumatic head injury this test is repeated, comparing your child’s cognitive brain function with their brain function prior to the injury. In doing so, diagnosis of concussion becomes more clear. All testing is confidential and saved in our secure database. ImPACT baseline testing is considered an industry standard test and data can be shared with your child’s doctor or specialist in the event of a head injury. These are just a few symptoms your child may experience if they sustain even a mild concussion. The team here at Monmouth Pain & Rehabilitation is committed to having athletes in the Monmouth & Ocean County area safely return to competition following any type of traumatic head injury. Call 732-365-0301 or fill out the form on this page to make your appointment in our Shrewsbury, Freehold, Wall, & Lacey for a baseline concussion test. To determine the treatment course for concussions, first, our practitioners do an evaluation to determine if the concussion is cervical, occular, or vestibular. It may fall under one or more of these trajectories. Treatment with our physical therapists can include manual or cervical work, balance work, and different exercises. Our office also collaborates with neuropsychologists to determine when the patient is ready to go back to any activities.